Innocent Erendira is the story of a young girl who inadvertently sets fire to the huge mansion belonging to her grandmother, a former prostitute. The grandmother, wishing to recover her loss begins to prostitute her granddaughter. The story takes on the characteristics of a bizarre fairy tale, with the evil grandmother forcing her Cinderella-like granddaughter to sell her body. They travel all over for several years, with men lining up for miles to enjoy her. Meanwhile, Erendira falls in love with Ulysees. She decides she has had enough. After an aborted attempt to escape from her grandmother’s clutches with her lover, she suggests to Ulysees that he kill the grandmother. He tries to poison the grandmother with arsenic in a birthday cake, but she survives this and continues to dominate. Finally, Erendira’s lover stabs the grandmother to death. By the time he regains his composure, Erendira has fled. Erendira draws parallels between Marquez’s ’magical realism’ and the folk tales and myths of Rajasthan, which also have the strange quality and sensuality that is seen in Marquez. 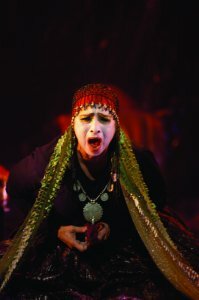 In production, there is a unique blend of rhythms, movement, costumes and performance style that creates links between India and Latin America that paves the way for the blending of different cultures, and becomes a significant inter-cultural experience. 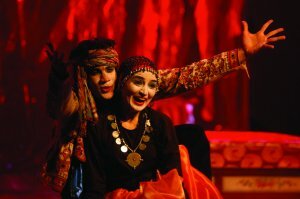 Visualized as a Rajasthani tale enacted by 6 female and 1 male actors, the production employs music, dance, puppets and masks in order to capture the strange, haunting and mystical quality of Marquez’s story of a woman’s articulation of her experience. In trying to evoke the ‘magic realism’ of Marquez in theatrical terms, the structure of the performance is both fluid and non-linear. 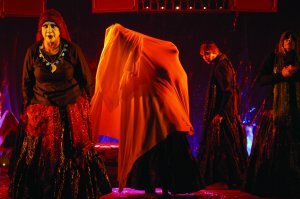 Taking its inspiration from both the Colombian ‘carnival’ where identities are suspended for a night of irreverent bacchanalias, as well as the trance-like rituals performed at Indian shrines where the ‘victim’ suspends his/her identity and is “possessed” by another – the production meshes both cultural ethos’ into a single celebratory performance. This allows for the playing out of Erendira’s traumatic experience.